Kendrick Lamar and Taylor Swift dominate the field. The 2015 MTV VMA nominations were announced this morning via Beats 1 Radio. 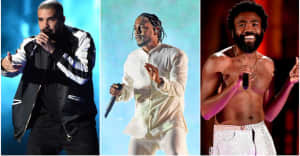 Taylor Swift pulled in nine nominations as a lead artist, while Kendrick Lamar received four as a lead artist and nine as a featured artist for his songs with Swift and Flying Lotus. In total, the MC's combined 13 noms match Lady Gaga's 2010 record. Check the full list of nominated clips below, and vote for your favorites at vma.mtv.com. Miley Cyrus will host the live VMAs ceremony Sunday, August 30 at 9:00 p.m. ET/PT on MTV.